Heat oven to 350°F. Line 9-inch square pan with foil; spray with cooking spray. Remove cookie dough rounds from tray; press cookie dough evenly in bottom of pan. (If dough is sticky, use floured fingers.) Bake 15 minutes. Pour condensed milk evenly over surface of cookie layer. 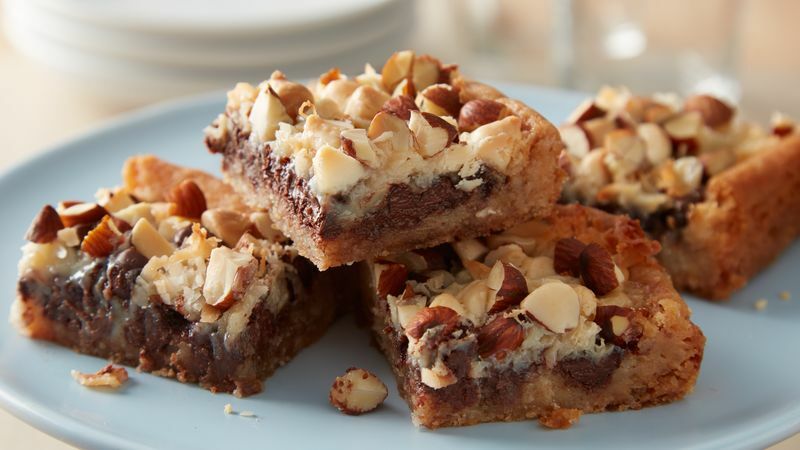 Sprinkle semisweet chocolate chips, coconut, white vanilla baking chips and almonds evenly over top. Bake 22 to 26 minutes or until bubbling along edges and coconut is lightly toasted. Cool completely on cooling rack, about 2 hours. For bars, cut into 4 rows by 4 rows. To line baking pan with foil, turn the pan upside down. Tear off a piece of foil longer than the pan. Smooth the foil around the pan bottom, and then remove. Flip the pan over, and gently fit the shaped foil into the pan. When the bars are cooled completely, lift out of the pan by the foil “handles,” peel back the foil, and cut into pieces. Try chopped pecans, walnuts or pistachios instead of almonds for a different twist!